"Encantada con mi pedido: atención al cliente, tiempo de entrega y calidad del..."
Strands of green jade olive shape beads. The approximate measure of the strand of green jade olive shape is 40 cm long and 35 grams. Each strand contains about 36 green jade beads and each bead measures about 12 mm x 8 mm. The color of this variety of jade is obtained by means of dyeing natural white jade. 10mm holed round beads white jade. 10 mm round beads white jade enfilades into strands around 40 cm long, weighing about 58 grams. The strand contain approximately 37 holed beads white jade. White jade is a semiprecious gemstone considered the stone of peace. Holed white jade beads, 8 mm. 8mm white Jade beads in strands about 40 cm long weighing about 35 grams. The strand contain approximately 47 pieces of 8 mm holed round beads. White jade is greatly appreciated and regarded as the stone of peace. 6mm Holed round beads white jade. White Jade strand is approximately 40 cm long weighing about 20 grams. The strand have about 60 6 mm holed beads white jade. White jade is considered the gemstone of peace. Round beads white jade size 4 mm. Holed white jade round beads enfilades in strands approximately 40 cm long. Each strand contains about 90 round beads 4mm of white jade and weighs 10 grams. approximately. White jade is the gemstone of peace. 10 mm Round beads of Yellow Jade. Yellow jade strands are 40 cm long and weigh 55 grams. approximately. They are about 39 10 mm round beads of yellow jade per strand. The color of this variety of jade is golden yellow. 8 mm Round beads of Yellow Jade. The strands of yellow jade have about 40 cm long and weighs around 35 grams. Each strand contains approximately 48 8mm round beads yellow jade.It is a jade golden yellow color, translucent. 6 mm Round beads of Yellow Jade. Stands with about 40 cm in length. Each strand contains 65 round beads of yellow jade and weighs 20 gr. approximately. The color of this jade is golden yellow. 4 mm round beads of yellow jade. 4 mm Beads strands of, yellow Jade. Approximately 40 cm long. Each strand contains approximately 90 4 mm round beads yellow jade and weighs 10 grams. approximately. This jade presents a golden yellow color and the beads are translucent in the light. 3 mm Round beads of Lemon jade. Strand with about 40 cm in length. Each strand of lemon jade contains around 90 round beads and weighs 10 gr. approximately. Beads of Green Jade 06 mm. Each strand of green jade measures about 40 cm long. The strands contain around 62 green jade round beads and weighed 20 gr. approximately. This type of jade is known as Malaysian jade. 4 mm round beads of Green Jade. 4 mm Beads of Green Malasyan Jade. String with about 40 cm in length. 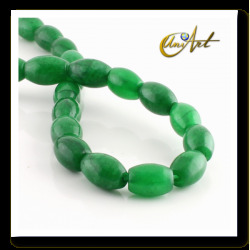 Each strand contains 90 green jade round beads 4 mm and weighs 10 grams. approximately. This jade belongs to a variety known as Malaysia jade. 4 mm round beads of Olive Green Jade. Beads of Olive Green Jade 4 mm (dyed). String with about 40 cm in length. Each string contains 95 balls and weighs 10 gr. approximately. 8 mm round beads of Lilac Jade. Beads of Lilac Jade 8 mm (dyed). String with about 40 cm in length. Each string contains 50 balls and weighs 35 gr. approximately. Available in two shades. 6 mm round beads of Lilac Jade. Beads of Lilac Jade 6 mm (dyed). String with about 40 cm in length. Each string contains 67 balls and weighs 20 gr. approximately.